The two most exciting segments in the Indian automobile industry are SUVs and scooters. What SUVs are to the overall passenger vehicle segment, scooters are to the overall two-wheeler market. The similarities are startling. In July, SUVs (79,092 units) comprised 27.18 percent of the overall PV market (290,960); Meanwhile, scooters (598,976) accounted for 32.96 percent of the two-wheeler market. For the April-July 2018 period, SUVs (313,968) were 27 percent of the total PV sales (1,164,461) while scooters (2,417,211) made up 32.25 percent of the overall two-wheeler market (7,494,420). For the first four months of FY2019, SUVs have recorded YoY growth of 13.15 percent while scooters are clocking YoY growth of 9 percent. Little wonder then that OEMs are doing all they can to introduce variants and new products in these two fast-growing segments. But when it comes to the world of two wheels only, scooters are showing a new aggressive face of sales. Importantly, entry level 100cc scooter buyers are gradually moving to 125cc albeit at a slow pace. Notwithstanding the Suzuki Access 125’s undisputed leadership in the growing 125cc scooter segment, a new rivalry has come to light over the past few months – the TVS NTorq versus the Honda Grazia. There's a pitched battle underway between the Honda Grazia (left) and the TVS NTorq with the sales lead changing every other month. Both new 125cc scooters appear to be competing neck-to-neck in the domestic market. In July 2018, industry data indicates that the TVS NTorq has once again beaten the Honda Grazia by more than a 1,000 units. While the TVS NTorq reported sales of 18,278 units in July 2018, the Honda Grazia sold 17,147 units last month. The NTorq had gone ahead of the Grazia for the first time in May 2018 but the Honda fought back in June. The tables are reversed once again within barely a month. The segment leader, Suzuki Access 125, has reported sales of 36,596 units last month, thereby registering a YoY growth of 36.66 percent. Notably, the Access 125 is the largest selling scooter for Suzuki Motor Corporation globally and its demand in India is driving global volumes for the company’s two-wheeler division. 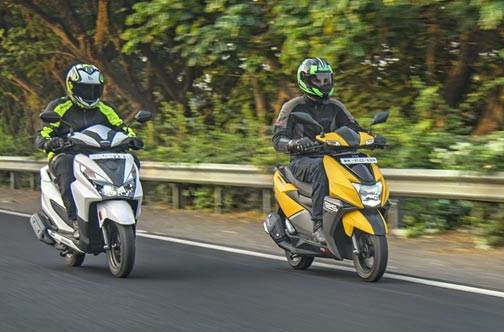 FY2018-19 will further record the growing numbers of the 125cc scooter segment as pointed out by several Autocar Professional reports earlier. While Suzuki aims to sell about 700,000 units of the Access 125 this fiscal, TVS Motor has a rather conservative sales target of about 200,000 units for its NTorq scooter. The Honda Grazia, whose target numbers remain undisclosed, had sold more than 100,000 units in less than five months of its launch in November 2017. Industry data suggests that the Honda Grazia has registered cumulative sales of about 77,000 units in the April-July 2018 period. Honda’s popular Activa continues to be India’s largest selling two-wheeler and in July 2018 the hugely popular scooter went home to 286,380 in July 2018, albeit growth was down 2.15 percent YoY. By that measure, it is undoubtedly the largest selling scooter in the domestic market. The 110cc TVS Jupiter is the second largest selling scooter with sales of 66,632 units in July 2018, up a mild 6.26 percent YoY. In the Top 10 scooters list for July 2018, while the Suzuki Access 125 has ranked as the third bestselling scooter (rising from fifth position in July last year), the TVS NTorq and the Honda Grazia take the seventh and eighth positions respectively. Following the Suzuki Access 125 closely is Honda’s evergreen Dio with sales of 35,709 units. However, sales of the Honda Dio, which is popular among the young college-going students in the domestic market, has de-grown by 6 percent YoY. This can be attributed to the increasing competition in the scooter market with new value-for-money offerings such as the TVS NTorq. The Hero Maestro stands at the fifth position with sales of 22,879 units in July, down by a sharp 43 percent YoY. The Maestro will soon see a new 125cc variant added to its umbrella, hopefully in the incoming festive season. The company aims to place its products in the fast-growing category with two scooter models, one of which will be called the Maestro Edge 125. Yamaha’s 113cc Fascino is the sixth top-selling scooter with sales of 19,108 units, up 19.43 percent YoY. Meanwhile, Hero MotoCorp’s Duet scooter has ranked ninth with sales of 16,710 units in July, up 15.90 percent YoY. Rounding off the Top 10 chart is TVS Motor’s Pep+ with sales of 16,031 units, up 17.98 percent YoY.